Epi Galleria epiphyllum nursery for plants, cuttings with photo catalog and care instructions. 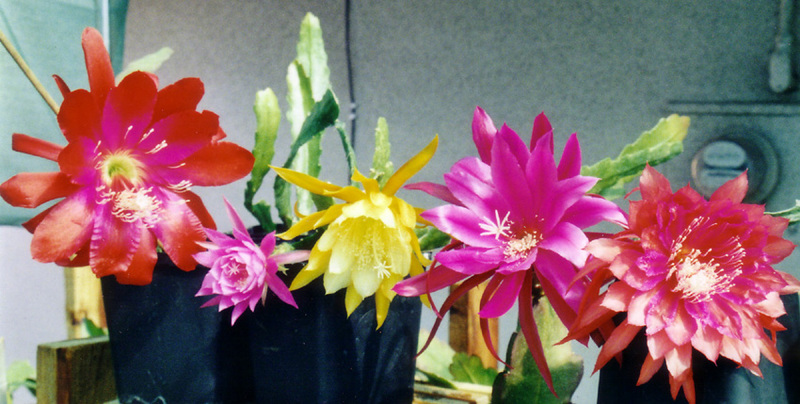 Mark Piette Epi Galleria specializes in the sale of epiphyllum and hybrid epiphyllum cuttings, often called orchid cacti, through the internet. All of the cuttings are grown by Mark Piette and guaranteed for quality. Generally each cutting is 6 to 10 inches long but some varieties have short growth and some are very wide. I try to maintain the 6 to 10 inch rule, but occasionally you will receive a smaller cutting, but I will not knowingly ship a cutting that is not viable. The cuttings are all treated with growth hormone. If you are not satisfied with a shipment, inform the galleria by Email or telephone within 5 days of receipt, and arrangements will be made to rectify any problems. Epiphyllums are easily cultured and fairly hardy, as long as you keep them in a friendly environment as described on the page "ABOUT EPIPHYLLUMS" and the page "CARE AND FEEDING" The catalog contains enlargeable photographs when they are available, so you can see what you are buying. Words cannot possibly do justice to these truly gorgeous natural treasures and, like a precious opal or a butterfly's wing, a photograph can't either. They are true cacii, but they have evolved differently than the desert cactus and do not have the unfriendly traits of desert cactii; ie. sharp spines. The growth habit varies from almost vine-like to tall and to a hanging habit. Thus some types do well in hanging baskets and some like a trellis. They are all excellent for a patio or in a cactus and succulent garden. The Mark Piette Epi Galleria is designed to take orders via the internet through PayPal or you can order by mail. Telephone orders are not accepted, but telephone inquiries are welcome as are inquiries via the site Email link below. The "ORDERING INFORMATION" page will tell you how to order if you are not using PayPal, and a printable order form is provided. If you use PayPal, you only have to login or register on PayPal when you first click on "Add To Shopping Cart". After that PayPal will add up your purchases, shipping and handling and, for California residents, sales taxes. Shipments are via U. S. Postal Service priority mail and can be tracked to delivery, but Epi Galleria cannot be responsible for security thereafter. If you have concerns about security after delivery, it behooves you to have your shipment sent to a secure address. Alternate shipping methods complicate the process, making it more time consuming and expensive for all customers. We Cannot Accept Orders For Delivery Outside The United States.